Beeston has a great community, and many of its community are greatly creative. This was firmly established in the first weekend of June when eleven local artists opened up their studios and invited us all in to see for ourselves. The annual ABC Art Trail involves artists from Attenborough, Beeston and Chilwell, which is how it got its name funnily, and as the name suggests it doesn’t just take place in Beeston. I followed the trail from back to front this year in Attenborough at Rita Miller’s stunning studio on Long Lane. Her compact converted garage was so extensively filled with serene landscapes and bold still life paintings my eyes took a while to take it all in. “Why did you start at the last venue?” I hear you exclaim. Well the point is, that it doesn’t really matter where you begin or where you end, the standard and variety of work on display will impress you wherever you go. In fact, in total there was an artist for every letter of the alphabet this year, so you were rewarded with more stunning pieces than anticipated to pore over at some venues. And of course if you do like to wander in a less haphazard way, the organisers had put together a back pocket map that you can refer to on your journey round with each location clearly numbered. And let’s talk about the variety! There were oil paintings, photographs, glass and silver jewellery, textile art, embroidered felted wool, ceramics, knitwear, stained glass, watercolours and sculptures as well as an opportunity to chat to Bob Child who offers a traditional bespoke framing service. It was truly an inspirational weekend and I even managed to pick up a few purchases along the way. It is worth pointing out though that not all the venues are artist’s studios. You could enjoy examples of Susan Harley’s landscapes hanging from the red, yellow and blue frames of the gym equipment at The Lanes Primary School, alongside glittering glass and gentle watercolours. In contrast to all that kaleidoscope of colour, Sara Gaynor’s ethereal photography sat rather well in its temporary home at a Beeston Dental Practice. It’s usual to pick a day and a selection of artists to visit as there are so many, but this year a new challenge was set. Three Beestonians (me, Matt and our intrepid photographer Christopher) set off early on bicycles to visit each venue and collect a unique piece of artwork in the form of a letter. As if organising and publicising this impressive show of local people’s work wasn’t enough, each collective of artists at each venue had handmade a letter in a combination of their own distinctive styles. It is impossible to visit all of the venues in one day and do them justice, to make sure that you have made the most of your visit you really do need to stay a while and ponder, and not just the artwork either. A number of our artists’ gardens were just as attractive as their artwork and we couldn’t resist a wander around some of the winding paths and buzzing flowerbeds. It struck me at one point, how community spirited these people are for opening up their studios, and in some cases their homes, to the general public to wander freely. They are sharing their sanctuaries and their personal collections with us as well as the pieces they created and put on display. The twiglets served in a hand thrown piece of pottery made by founder member Alan Birchall didn’t go unappreciated, and the plentiful refreshments welcome too after a few hours of cycling. Another wonderful thing about the ABC Art Trail is how welcoming the artists are. Their joy at receiving visitors was unrestrained and genuine and this made us want to linger a little longer at each venue. I met with one of the artists and organisers Karen Attwood before the event and as we discussed the work she would be exhibiting it was obvious how much of herself she was pouring into her pieces. Not only is her textile work detailed and time consuming, each piece has a personal resonance which must make it hard to let them go at times, but then sharing is what this event is all about. The artists are more than happy to talk about their inspirations and processes, it’s a celebration of creativity! It is also evident they have an appreciation of each other’s work, and although much of their work is for sale there is no pressure to buy. If you do happen to be seduced by a brightly coloured piece of glass or an exciting sliver of silver then be rest assured that you are getting good value for money and you are helping a living artist in your community to thrive, and that’s got to be a good thing right? The experts say that art appreciation promotes quality of life and makes you feel good. According to Professor Semir Zeki, neurobiologist at the University College of London, when you stare at great artworks, the part of your brain that is stimulated is the same as when you fall in love. We definitely fell in love, over and over with the amazing talent and with this home-grown event that makes art accessible for all. And have you guessed what those eleven letters spelled out? ABC Art Trail of course! 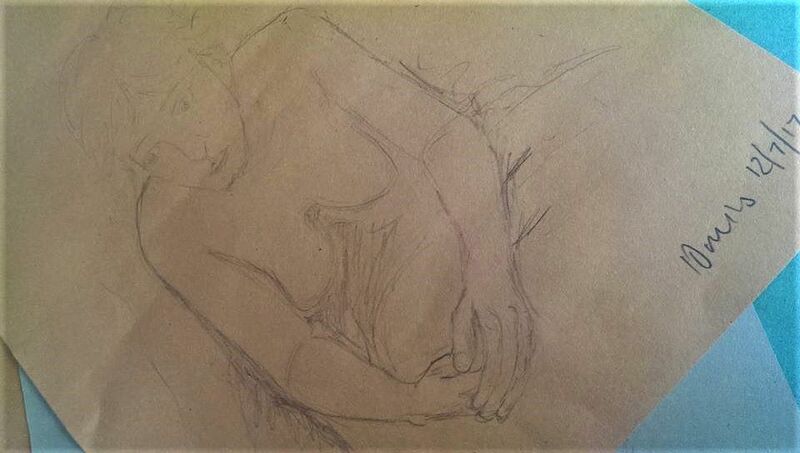 Debra Urbacz grabs her pencil and sketches the disrobed…. This issue’s article comes to you from the serene scene that is inhabited by Beeston Canal Heritage Centre. Steeped in nature, it is the perfect backdrop for the life drawing classes, that are currently running in the beautifully renovated studio room upstairs, within the old lock keeper’s cottages. I have been itching to get to one of these classes since they started three weeks ago and finally made it this week, and thought I would share the experience. When I arrive, the room is quiet and gently lit by tiny spotlight stars. It is my first time at the class and I am more than a little apprehensive as it is a very long time since I had done any ‘real’ drawing. I felt a little under the spotlight. However, it was a small friendly group that greeted me and I was introduced to a host of smiling faces. I already knew Janet who was running the class from the ABC Arts Trail and seeing her artwork displayed locally. She explained that this was an informal class, with a break in the middle for tea and cake. This and the relaxed atmosphere quickly put me at ease. I picked up my 6B pencil, and a sheet of the paper that was provided, ready for my first challenge. I wasn’t quite prepared for how swiftly one minute speeds by when you are trying to replicate a human being on paper but my first sketch consisted of a shoulder and part of an arm. I persevered though, and by the time I got to my last sketch in the ‘quick fire round’ I had progressed to achieving a little bit more. The ten-minute sketches were better, although I seemed to do a lot more rubbing out than any of my companions. I was pleased to see that my hands were beginning to get into the groove again. At the break, the conversation was free flowing and despite the fact we had just spent the last hour peering intensely at a naked person, there was no awkwardness at all. After all when you are so deeply immersed in nature, what could be more natural than the human form with all its graceful dips and curves? I was a little bit in awe of the model. Always a failure at musical statues myself, I had to ask how she kept her composure and held the poses for longer periods. “What do you think about, where does your head go?” I tentatively ask. Well dear reader, I am not sure what I was expecting but can tell you the answer was that this model amusingly distracts herself with hearty numbers from the Monty Python musical ‘Spamalot.’ Well why not!? The second half of the class seemed to go much more quickly. I became thoroughly absorbed in producing at least one decent drawing and was surprised to find that I had not yet glanced at anyone else’s work, nor had they at mine. The lady next to me was using rainbow pastels, from a stash in a box near her feet, and I admired the effect she had created with the small strokes of colour. Happy to remaster the pencil I set to work drawing the prone figure on the floor, paying particular attention to posture and proportions. The extremities provided the most challenge for me and I must have drawn her hands five or six times! I spent the time I had left at the end practising drawing the model’s feet. The end of the session was as easy as the beginning. As the final timer sounded, Janet informed us that it was the end and we packed away. I complimented my neighbour on her work and rolled mine up to pop in my bag ready for the cycle ride home. I was pleased with my efforts but relieved we did not have to share them with the rest of the group as I had done back in my college days. Instead, I wandered around the cosy space to take a closer look at the Beeston Snappers’ photography exhibition, a series of photographs which have captured what were the old cottages in their derelict state before renovation. What they have achieved with those cottages has to be seen to be believed. Retaining many of the original features, the rooms feel bright and spacious. With a café and gift shop downstairs and plenty of outdoor space, the centre invites you to stay a while and bathe yourself in calm. Perhaps it is its proximity to the canal but the air of tranquillity will certainly be pulling me back for a visit. 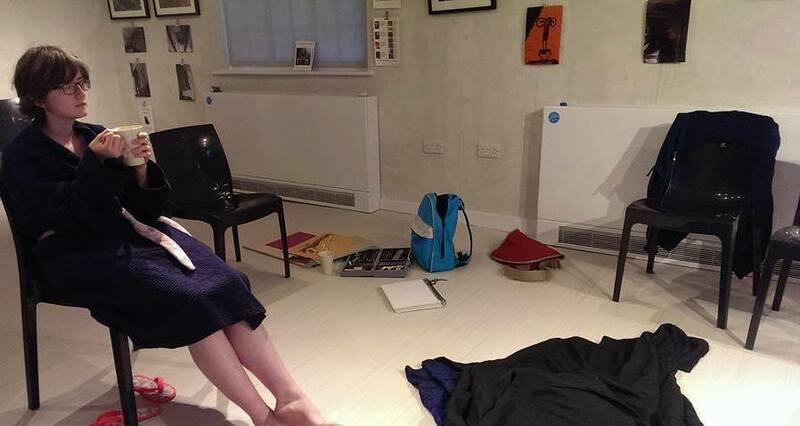 The Life Drawing Classes are currently running on Wednesday evening for two hours from 7:30 pm. There is no need to book and it is just £8 per session with refreshments and art materials provided. Contact Canalside Heritage Centre by email via their website www. canalsideheritagecentre.org.uk, on Facebook or by phone on 0115 922 1773 for information about all of their classes and events. The Lock Keeper’s Cottages Exhibition features the work of four different local photographers, Sara Gaynor, Lynne Norker, Jenny Langran, Catherine Smith and is on display until the end of August. Street Art has become one of the ‘sights to see’ in many European cities. With exciting colours and raw energy it has been transforming urban landscapes for decades. Since Keith Haring’s successful attempt to commercialise art on the streets, tired architecture and boring buildings have been given the wow factor all over the world, some in incredibly creative ways. In 2014 Google launched an online street art gallery to preserve many iconic images, which demonstrates the extent to which its popularity has grown, and how it has come to be recognised as an artform. You may remember reading on the cover of Issue 51 about the creative discussions that one group of Beestonians were involved in about creating something ‘bright and beautiful’ to enhance the look of our town. According to an update from Jeanie O’Shea, who is one of those driving the project forward, the group have now met with John Delaney who is the Broxtowe estate manager in charge of Beeston Square and the head of planning, Phil Horsefield. Both have been encouraging and keen to listen to their creative proposals. There also happens to be budget available for the project and local councillors are making positive noises in their direction too. Montana Colours in Hockley are using their connections to acquire submissions from UK and International Street Artists that will then need approval to secure the funding. It has been suggested that the artwork will incorporate some of Beeston’s best known characters and symbols of its heritage and that it will compliment as well as enhance the current surroundings. It has been anticipated that the artwork will adorn the wall that extends behind ‘Birds’ and will be visible by people approaching Beeston interchange via Middle Street or Station Road. With any luck it will cause visitors, or those passing through, to avert their eyes from the concrete and mud jungle that has been left behind since the demolition of the old bus station, whilst the ‘powers that be’ drag their heels in deciding what to do with it. If everything goes to plan we should be looking at receiving our spray-painted masterpiece as part of a week-long festival next Spring. The Return to Handmade – Hipster Trend or Quiet Revolution? If like me you like to buy unique presents for people at Christmas and prefer to shop locally, then you will have been more than aware of the vast number of ‘craft’ shopping opportunities that were available to us in Nottinghamshire this year. We may ask ourselves, at a time when goods are so easily mass produced all over the globe and readily transported to us in record time, why is there this steady uprise in the making and selling of handmade items? Has it become trendy to make your own or is it a result of the current economic downturn? Are we getting bored of the replicated products we see on all the shelves, in all the shops, and are instead striving for originality? Or could it be that we are starting to value again the time and care that is spent on something that has been made from start to finish by one person’s skilful hands. According to the UK Craft Council the consumption of craft has been on the increase for quite a number of years. Their 2010 study showed that 40% of the adults in their sample had purchased a craft object and 23% would consider buying craft. It also showed that the greatest demand was for contemporary or ‘cutting edge’ craft with 97% of craft buyers supporting this market. It might be worth making the distinction at this point, between the different categories that handmade can be grouped into. By definition, to ‘craft’ something is to make it with one’s own hands so this would appear to cover a wide range of objects. However, currently this seems to range from something you made impulsively out of card, with the kids on a wet Saturday afternoon, to the kind of objects d’art you might see at the acclaimed ‘Lustre’ exhibition which features at Lakeside Art Centre in November. In the Craft Council research the words ‘authenticity’, ‘quality’ ‘handmade’, ‘workmanship’ and ‘genuine’ were all attributed to the genre. Is the name we give to the work that is typically produced by graduates who have honed their skills academically and have created a business which involves making, marketing and selling their own pieces. We tend to look upon this as the ‘high end’ of the craft market and it would be most likely to be sold at larger handmade events, such as ‘Craft in the City’ in Waterstones, rather than the local church Christmas fair. It is this market that the Craft Council’s 2015 three year strategy supports, in their evaluation of craft trends and their impact on policy and practice. Always a tricky one this, and without getting into the ‘what is art?’ debate, we tend to attach this label to things that are made purely for their aesthetic value rather than their everyday use. Whereas craft objects tend to be created for their practical aspects and are often born out of a need for something that didn’t previously exist. Let’s take the tea cosy as a good honest utilitarian Nottingham example – you don’t want your tea to go cold whilst it’s mashin’ duck! So, do you need to be creative to be able to do crafts? Well, not entirely. Sometimes learning the steps to make something and being technically minded is all you need to produce a perfectly presented set of greetings cards or an origami animal. Natural creativity is generally more expressive and something that comes and goes. The creator can find themselves frustrated when an idea they had doesn’t quite work out the way they imagined it and this is often the artist’s nemesis. But without doubt, undertaking some kind of creative pursuit has been scientifically proven to have a positive effect on our well-being. It may be just about finding the one that suits you. Very! There are many different groups of artists and makers networking and planning exhibitions as we speak. If you were lucky enough to visit last year’s ABC Arts Trail – twenty five artists at twelve venues – you will already be aware of the wealth of talent we have in Beeston and the surrounding areas. In fact one Beestonian, Marysia Zipser, was so taken by the cultural and creative richness of this town she set up ACT (Art-Culture-Tourism) in December 2013. According to her recent interview in the West Bridgford Wire, she is ‘on a mission to make Beeston the art and culture capital of the UK.’ Although she ran ACT voluntarily for the past three years, in May 2016 it became an official registered organisation. On a smaller scale there are community craft groups currently running from Two Little Magpies, Beeston’s newest gift shop which houses a fantastic selection of locally produced cards, prints, textiles, jewellery and garments. There is gallery space at Mish Mash on Chilwell’s Creative Corner as well as some of the local restaurants and tea rooms, and regular workshops at Artworks, Heidi’s Home Furnishings and The Fabric Place. When I was four years old, I was a fantastic artist. My Mum’s makeup – I loved lipstick. The skirting board going up the stairs was brilliant. It went on and on, and I loved making a wiggly continuous line along it. It was a stunning landscape – mountains, valleys, hills, hummocks and some sheer cliff edges. It was enhanced by being on the diagonal, rising upwards. My parents painted the living room a wonderful shade of lilac. I really loved sneaking in and making hand prints in the wet paint. My parents preserved the hand print art by hiding it behind the sofa. Not sure that they loved it as much as I did. Steamed up windows – how could anybody resist drawing on those? It was extra special when there was ice too. It curved up beautifully in the corners, like a Victorian illustration, and added extra sensory crunch to my artistic creations. It was such fun to draw with my fingers in the condensation, leaving cold drips streaming from the trails I drew. Paper – so many wonderful textures, colours, surfaces. I really liked to use the sugar paper at school. It was mysterious to me – we didn’t have anything like it at home. It was brightly-coloured, rough on one side and smooth as ice on the other. When I folded it the folds stood proud and didn’t dissolve back into the surface. It was even more fascinating to tear it and create rough, irregular frayed edges. I found the perfect combination of media when I was allowed to use pastels. Degas created masterpieces using just the pure pigment of pastels and his fingers. I’m off now to get some chalky, densely-pigmented pastels and some lovely, rough sugar paper. The children at nursery will love that. I strongly believe that when we draw for children, cut things out for them, give them colouring sheets and dotted lines, we chip away at their childish joy. The joy they feel in just drawing, painting, exploring, experimenting and creating. We are telling them that they are doing it wrong and that they cannot do it the right way. We are teaching them that a house has to be a square with a triangle for a roof and a door set smack bang in the middle of it. To encourage our children to be creative, we have to let them be creative and create what they see, what they feel and what they can imagine. If they want to draw themselves as three times the height of your car, that’s fine. If they want to make a snowman with three eyes and two mouths – fine. Who says that snowmen have to look a certain way? If they want to put their hands in the paint and swirl all the colours together into one slurry, then slowly and systematically cover every square inch of the paper, or piece of foil, or box, with that colour, then fine. Let them enjoy the process and learn how to make marks, how to enjoy making art and how to take pride in their work. There is plenty of time for them to conform when they are older and when they want to. Imagine if Degas had been told not to use his fingers and to stay within the lines.